Ambition, blunders and glimpses of ingenuity: Silver! 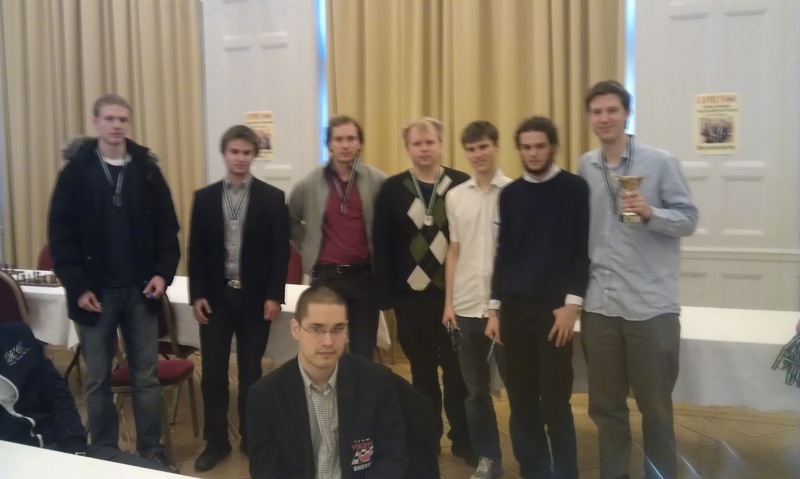 Last weekend the 3 last rounds of the Swedish Leauge was played in Västerås. The conditions were, as always in Västerås, excellent. The organizer - former bughouse God André Nilsson - is doing a great job for the chess in Sweden nowadays, instead of playing bughouse. LASK were to one team against which we should win, and two very difficult matches. As first place seemed unrealistic, especially with some late cancellations, our goal was to keep the 2nd place. This ending should of course be an easy draw. White has a good knight on d4, some slight pressure on the c-file and a slightly more active king. 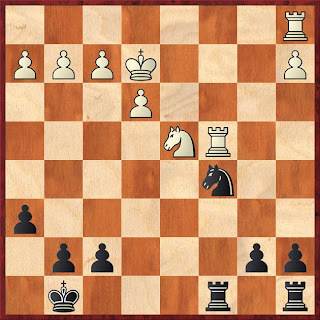 Black has the better pawnstructure and a very solid position. But how to achieve the draw in the easiest way? By, for example, 18...b6! 19.Rac1 Rd8 and black puts his rook on d6 with a fireproof fortress. If white tries to go a4-a5 black will get a weak pawn on b6, but by trading the knights the 4v3 rook ending is very easily drawn. Instead I went 18...Ne4 in the game, after calculating for a long time. After 19.Rac1 Nd6 20.Rc7 white does penetrate, but I figured out that he could do nothing - I just walk with the king to d8. This was all correct, and I will manage to trade both rooks. All fine? No! After 20...Kf8 21.Kd3 Rxc7 22.Rxc7 Ke8 23.e4 Kd8 24.Rc5 Rc8 25.Rxc8+! the knight ending turned out to be very difficult for me - something I wasn't even close to realizing on move 18. The ending could probably still be held, but it's clear that black is facing a very difficult defensive task. In the game Gdanski just advanced his kingside pawns and won by utilizing the weakness on h6. The rest of the match was pretty exciting. 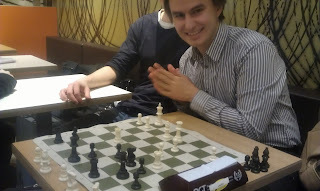 GM Tikkanen won a very nice game on 1st board against the normally very solid Per Vernersson. Axel Smith managed to hold a difficult ending with white against GM Cicak, in a game where both players offered draws at different points! Our team captain FM Sebastian Nilsson made an inaccuracy in the opening against the 8 time swedish champion IM Axel Ornstein, who then showed no mercy. 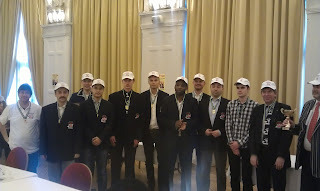 My bughouse co-world champion FM Linus Olsson outplayed his opponent as black in a complicated Benoni, but offered a draw to secure match victory. Our luckiest board was (as always?) FM Drazen Dragicevic. With white he quickly got a terrible position, but true to his style he showed amazing fighting spirit and in a mutual time trouble even managed to win the game! Very well fought! On the 7th board we had a debutant - Fredrik Hansson. 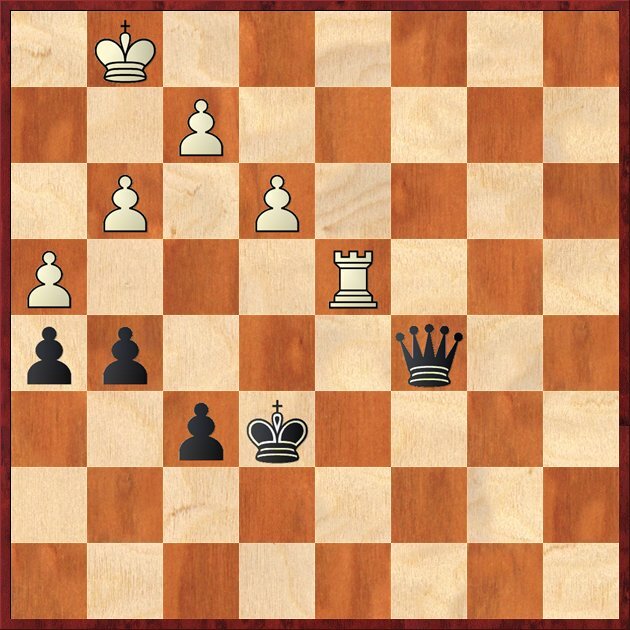 As black in an Exchanged Ruy Lopez he won what seemed to be a pretty convinzing game, and so did Mladen Gajic on the last board. The final result, 5-3, felt fair. The win is not that easy, as white is very close to having an impregnable fortress. However, there is a win. First, put the Q-f3 and the K-c5. After that it turns out to be amazingly difficult for white to make a move! After thinking about that position for some time, you will realize that it's just winning for black. White has to play, for example 1.Kf1 Qh1+ 2. Ke2 Qb1! and white is in another zugswang and black wins easily, for example 3.Kf3 Qf1! with the decisive threat of g4. Of course this was very difficult to see during the game, and Mladen instead took the draw, thus securing our silver medal!